Looking to amp up your cardio and strength training routine? Circuit Challenge class will get your heart rate high and your muscles strong! You will be challenged with high intensity cardio intervals, functional training moves, agility drills, strength training exercises, and more, to get you out of your regular routine and into your next level of fitness. Dig deep, and this class will challenge you from the inside out! Jo-Ann is an SDSU alumnus, and earned her BA in Psychology. She has been a regular at Aztec Recreation since its opening and has been serious about her physical activity ever since. After taking almost all of the classes Aztec Recreation had to offer, Spinning® was the one exercise she couldn’t get enough of. 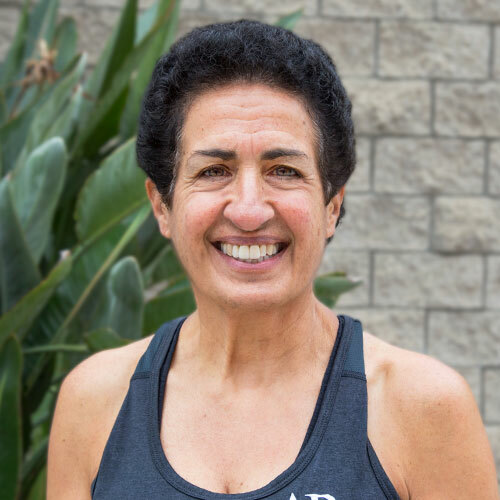 Jo-Ann is a level 3 Mad Dogg Athletics Spin® Certified Instructor, holds an AFAA certification in Primary Group Fitness, and is also trained as a R.I.P.P.E.D and CoreBar instructor. She has been teaching Spinning® at Aztec Recreation since 2006, and uses rock and roll-based music for a fast-paced exhilarating ride, focusing on building endurance. Jo-Ann also teaches Circuit Challenge, a high intensity class guaranteed to push your limits. Jo-Ann really enjoys the physical and emotional benefits from teaching. "Having newcomers return, and become regulars is one of the greatest rewards I can receive. It’s a great cardio workout, and a wonderful way to start the day."